Additional nights may be available before or after our group dates. If interested, please contact the Trip Leader. The 7-night rate includes two nights after the group departs. A South Pacific dream vacation is easier than you think! Fiji is just two meals and two movies from the U.S. west coast. This land-based dive resort package is the perfect chance to dive the brilliantly colorful "soft coral capital of the world." A complement to our separately-priced follow-on Nai'a liveaboard cruise from September 28-October 5, 2013, the two combined trips give us an opportunity to dive two distinct areas of Fiji, Bligh Water in central Fiji and Taveuni further north, each known for their great expanse of hard corals and unbelievably colorful soft corals and the vast array of marine life that calls Fiji home. We'll stay at the Garden Island Resort in Taveuni, Fiji, known for its lushness and its proximity to Fiji's signature Somosomo Strait diving. We have room for ten LGBT divers and our friends, though our time at Garden Island Resort will not be exclusively LGBT. We'll share our dive paradise with other buddy teams who have signed on independently with the resort. Within minutes of the famed Great White Wall and Rainbow Reef, Garden Island Resort is the perfect base for enjoying the spectacularly beautiful Taveuni area of north Fiji. All of our dives will be on the famed Rainbow Reef, including the scattered reefs in the Somosomo Strait and the fringing reef south of Vanua Levu. The nutrient-rich waters flowing through the Somosomo Strait are responsible for some of the most incredibly colorful displays of soft corals in the world. We have our choice of twenty spectacular dive sites within 10-20 minutes of our dive resort. Our divemasters will select the best dive sites based on currents and weather conditions to ensure that all of our dives are memorable ones. If we get a full complement of divers for this trip, we'll have our own day boat for exploring the magnificent Rainbow Reef and Great White Wall. In the Somosomo Strait, the diving is on patch reefs that are fairly shallow (10-22m/30-70ft), but some may have challenging tidal currents. The fringing reefs feature wall diving with deeper profiles (15-30m/50-100ft). Drift dives are done when sites and tides are favorable. 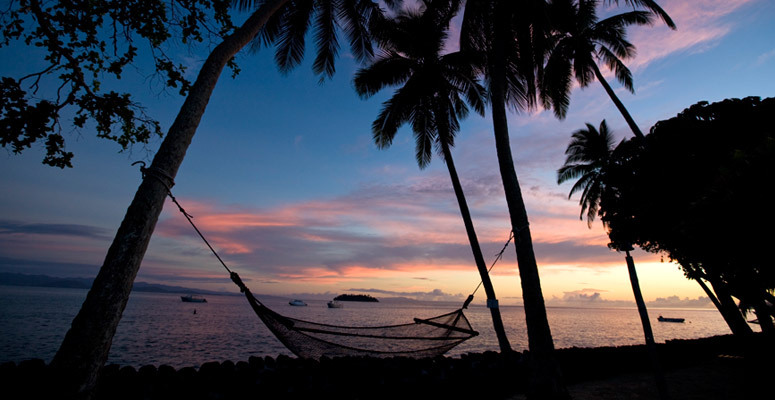 October is lovely springtime in Fiji, and water temperatures are expected to average 75-78°F or 24-27°C. Most divers would find a 5mm or 7mm full-length wetsuit to be comfortable. Layering with a hood, beanie or hooded vest is recommended for divers who tend to feel the chill after repetitive dives. Air temperatures in October could be in the 80°F's during the day, falling to mid-60°F's at night. There may be a little rainfall during the trip, typically at night, but there should be plenty of sunny days, starry night skies and fresh air! In addition to diving, we'll have optional opportunities to explore Taveuni's beaches, hike to waterfalls and experience a traditional lovo feast and festive meke where local villagers sing and dance for us. Plenty of kava, Fiji's traditional ceremonial drink, will be flowing! Tipping is neither encouraged nor expected in Fiji. You should plan to arrive in Taveuni, Fiji, sometime on Monday, September 23, 2013. After our time at the dive resort ends, you may plan to depart Taveuni on Saturday morning, September 28. Likely, we'll take the morning flight out of Taveuni to give divers continuing on to our Nai'a liveaboard cruise plenty of time to meet the boat. Anyone returning home directly after our time at Garden Island Resort may plan to leave Nadi, Fiji, on Saturday afternoon, September 28, or later. Fiji Airways (formerly known as Air Pacific) is the recommended carrier flying to Nadi, Fiji (airport code: NAN) from the United States. The price of economy seating on this flight typically runs ~$1,200 roundtrip, including fees. The Fiji Airways flight leaves Los Angeles airport (airport code: LAX) in the late evening and arrives in Fiji early the next morning (two calendar days later owing to crossing the international date line). *The above itinerary is a sample. Other departure cities may be arranged. If using PayPal, please make payment to this email address: paypal@rainbowdivers.org All PayPal payments should be increased by 3% to cover transaction fees charged by PayPal to the club.